The Gastonmille Millenium Protect Kit is a safety overshoe for visitors entering a plant. These overshoes meet the requirements for personal protective wear. 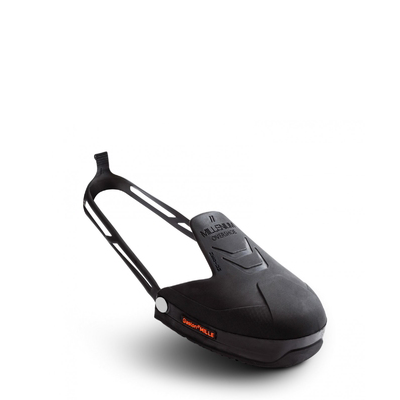 This overshoe can be fitted onto many shoe types, it has an elastic strap for all heel types. One kit includes five pairs: one pair in size Small + two pairs in size Medium + Two pairs in size Large. HOW DOES THIS OVERSHOE PROTECT ME? Foot injuries at workplaces are very common and it may come in any shape and size. This is why wearing safety shoes, overshoes or boots with toe caps is essential as it will protect your feet from mishaps. The Gastonmille Millenium Protect Kit has a steel 200J toecap making this overshoe reliable protection against crushing and impacts. This overshoe has an extended protective flap to protect the back of the foot. This overshoe is made from TPU (Thermoplastic Polyurethane) which provides your shoe with improved slip resistance. The Gastonmille Millenium Protect Kit upper is made from quality TPU material which ensures that your feet stay dry and safe throughout the workday. The Gastonmille Millenium Protect Kit is made up of A washable material, that permits hygienic re-use The Gastonmille Millenium Protect Kit is made up of A washable material. That permits hygienic re-use.